Show support for this rally on facebook! Go to the rally facebook event page HERE and click like or click join to tell everyone that you are going to the Kountze Rally To Support Kountze Kids Faith Oct. 5th, 2012 7:30PM @ Kountze Lions Home Football Game. More rally info at SupportKountzeKidsFaith.com. Everyone please show up to the next Kountze Lions home football game to show support for the kids in Kountze. Show up with red shirts and bring signs with Bible Verses and religious encouragements. Bring signs that say we support these Kountze kids who are standing up for their Constitutional Religious Rights. Remember last Christmas when the Henderson County Courthouse in Athens, Texas came under attack by Atheists who told them that they had to remove their nativity scene? The residents of Athens stood up against this attack and thousands of people from everywhere came to rally in support. It was amazing and the nation watched as Athens fought off the Atheists. Let's do the same thing here! 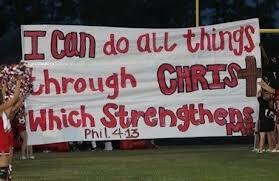 This is the first home game since these kids were told they could not have signs with Bible verses or anything else religious on them because the KISD Administration acted on some WRONG advice from the Texas Association of School Boards (TASB). These kids are standing up for their faith and for the Constitution so we should stand up for them! Many people hear know that the First Amendment says that Congress shall make no law establishing Religion, but many people forget the second part that says Congress shall also NOT Prohibit the Free Exercise of Religion. These students have a right to make their OWN PERSONAL signs to hold up at a PUBLIC event. Let's give these students a home game rally like they have never seen before! With all the national attention this Kountze situation has received, the nation is LITERALLY watching us!